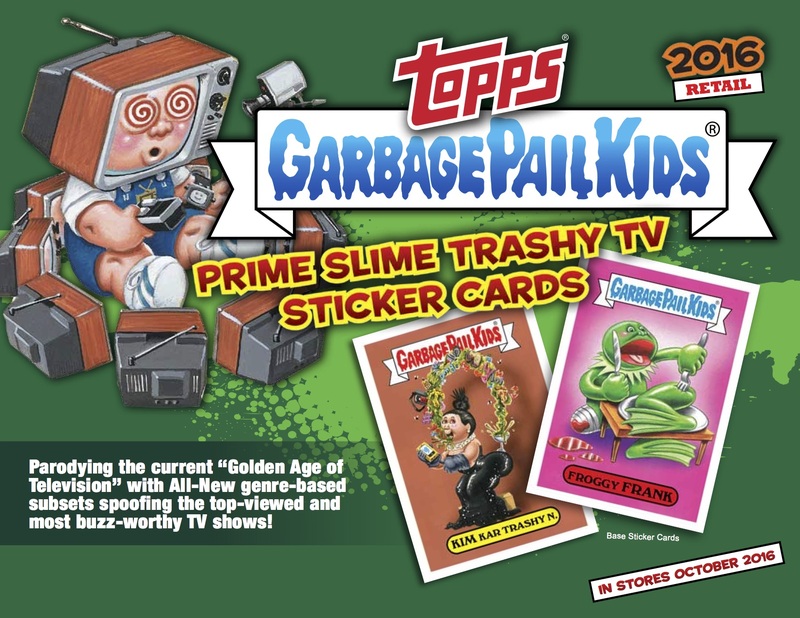 Last week we posted information on the Hobby/Collector Sell Sheet for the newly announced, 2016 GPK Series 2 Prime Slime Trashy TV. As retailers begin posting the new set for pre-orders we now have the Retail Sell Sheet. 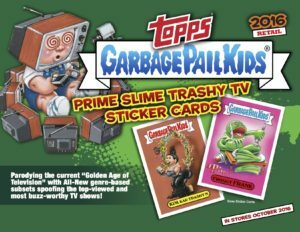 Based on the retail sell sheet for 2016 GPK Series 2 Prime Slime Trashy TV, Topps looks to be following the same formula they did in the 2016 Series 1 Apple Pie set. The usual retail inserts and parallels will once again appear. The Green Puke parallel is back at one per retail pack, in addition the Fools Gold parallel will be found throughout all pack types and will be # /50. Artist Autographs and Printing Plates will also be found through out all pack types. While regular sized artist sketch cards will be randomly inserted into all retail packs. 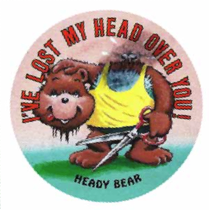 Topps decided to continue the Bathroom Buddies/Gross Bears reprints in Series 2. As with the AAAP release there will be two different Blaster Boxes. “EA” Boxes will contains 3 different Bathroom Buddies cards, while “SE” Blaster boxes will contain three different Gross Bears cards. Also like the previous release, Topps will be randomly inserting artist Loaded Puzzle Sketch Cards in Blaster boxes. These 4 card sketch cards featured some of the best work in 2016’s first GPK series. Blister packs which were sold in Wal-Mart and Toys R Us with the Series 1 release will also return. This time new versions of Adam Bomb/Boom will be found in Blister packs only called, Adam Bomb Your TV Stickers. Also returning is Fat Packs. These packs will contain 18 base cards, 2 Puke parallels, and 2 Classic Rerun Stickers. No information yet on the set size for the Classic Rerun stickers, but Series 1 offered an 18 card Patriots set in a similar fashion. Another draw for the Fat Packs is this is the only place to find single artist Panoramic Sketch cards. As you can see Topps is going with the same formula in Series 2 as they used in Series 1 for 2016. The only thing we don’t know yet is if the Yellow Pee borders will continue as a Target Gravity Feed exclusive. 2016 Garbage Pail Kids Series 2 Prime Slime Trashy TV is set to hit stores on 10/5. You can dins a PDF version of the Retail Sell Sheet here, or see pictures below. This entry was posted in 2016 Trashy TV, Retail, Sell Sheet and tagged 2016 Trashy TV, Retail, Sell Sheet by Jeff. Bookmark the permalink. That’s my understanding most of the cards are based off of current shows.